Bassbreaker Series guitar amplifiers continue Fender's storied lineage with a kind of "parallel evolution"Â that breaks away from tradition with dark gray lacquered tweed covering, refined pointer knobs and unique circuitry as well as power tubes and speakers hinting at the U.K. amps that 'borrowed'Â Fender circuits in the 1960s. The sound is one of pure tube greatness for today's players. Channel One offers pure, bell-like clean tones and warm crunch when driven, thanks to its Blackface Deluxe amp circuitry with extra headroom and 30-watt output. Channel Two's circuit is based on an 18-watt '61 brown Deluxe, offering plenty of power amp overdrive with easily controlled dynamics at 'real world'Â volume levels. An included footswitch allows easy selection between the two, and four EL84 power tubes add a distinctive midrange punch. 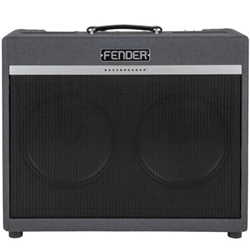 •Matches perfectly with optional BB-212 extension cabinet Bassbreaker Series The late-'50s tweed-covered Fender Bassman is often called the grandfather of all guitar amps. What started earlier that decade as the companion amp for the Precision Bass actually became one of the most beloved guitar amps of all time, thanks to its simplicity and versatility, its wide dynamic range and warm tube overdrive, its full-frequency stage-filling power and its rugged roadworthiness. Fender tweed amps evolved into the brown, blonde, blackfaceÂ and silverface models of the 1960s. Along with the dramatic evolution of their look, the amps were redesigned each time to sound brighter and cleaner. New Bassbreaker Series guitar amplifiers continue that fascinating lineage with yet another sound and style, a kind of "parallel evolution"Â in which time-honored Fender amp DNA results in a satisfyingly dirtier tone that evokes the dawn of hard rock. The new series takes the 45-watt 1959 Bassman design and breaks it with features including the early Fender block-letter logo, black tweed covering, and refined pointer knobs plus power tubes hinting at the U.K. amps that "borrowed" Fender circuits in the 1960s. The sound is one of pure and unadulterated tube greatness. Number of modes: Speakers Speakers: 2x12"
Dimensions Width: 26.25 in. Height: 21.87 in. Depth: 10 in.